Contains milk and soy ingredients. Processed in a facility that also processes wheat, egg, fish and shellfish ingredients. Protein Blend (Milk Protein Concentrate [Supplying Calcium Caseinate and Whey], Whey Protein Concentrate, Micellar Casein, Calcium Caseinate, Hydrolyzed Whey Protein Isolate, Whey Protein Isolate), Maltodextrin, Alkalized Cocoa, Sunflower Based Creamer (Sunflower Oil, Corn Syrup Solids, Sodium Caseinate, Mono and Diglycerides, Dipotassium Phosphate, Tri-Calcium Phosphate, Tocopherols [Emulsifier]), Natural and Artificial Flavors, Salt, Soy Lecithin, Guar Gum, Silicon Dioxide, Acesulfame Potassium, Sucralose. Note: To maintain product freshness, store in a cool, dry place. Shake container before use. Mix 1 serving (1 heaping scoop) with 8 oz. or mix 2 servings (2 heaping scoops) with 16 oz. of cold water or skim milk in a glass or shaker cup. Use between major meals and after exercise. Drink 8 to 10 glasses of water daily. For maximum results, consume 4 scoops daily for a minimum of six weeks. Protein Blend (Milk Protein Concentrate [Supplying Calcium Caseinate and Whey], Whey Protein Concentrate, Micellar Casein, Calcium Caseinate, Hydrolyzed Whey Protein Isolate, Whey Protein Isolate), Maltodextrin, Taurine, Glycine, Natural and Artificial Flavors, Sunflower Based Creamer (Sunflower Oil, Corn Syrup Solids, Sodium Caseinate, Mono and Diglycerides, Dipotassium Phosphate, Tri-Calcium Phosphate, Tocopherols [Emulsifier]), Salt, Soy Lecithin, Guar Gum, Silicon Dioxide, Sucralose, Acesulfame Potassium. Protein Blend (Milk Protein Concentrate [Supplying Calcium Caseinate And Whey], Whey Protein Concentrate, Micellar Casein, Calcium Caseinate, Hydrolyzed Whey Protein Isolate, Whey Protein Isolate), Sunflower-Based Creamer, (Sunflower Oil, Corn Syrup Solids, Sodium Caseinate, Mono And Diglycerides, Dipotassium Phosphate, Tri-Calcium Phosphate, Tocopherols [As Perservative]), Taurine, Maltodextrin, Glycine, Natural And Artificial Flavor, Salt, Soy Lecithin, Guar Gum, Red Beet Powder (Color), Acesulfame Potassium, Sucralose. Contains milk and soy ingredients. Processed in a facility that also processes wheat, egg, fish and shellfish. Protein Blend (Milk Protein Concentrate [Supplying Calcium Caseinate and Whey], Whey Protein Concentrate, Micellar Casein, Calcium Caseinate, Hydrolyzed Whey Protein Isolate, Whey Protein Isolate), Maltodextrin, Taurine, Cocoa Processed with Alkali, Glycine, Natural and Artificial Flavors, Sunflower Based Creamer (Sunflower Oil, Corn Syrup Solids, Sodium Caseinate, Mono and Diglycerides, Dipotassium Phosphate, Tri-Calcium Phosphate, Tocopherols [Emulsifier]), Salt, Soy Lecithin, Guar Gum, Sucralose, Acesulfame Potassium. Protein Blend (Milk Protein Concentrate [Supplying Calcium Caseinate and Whey], Whey Protein Concentrate, Micellar Casein, Calcium Caseinate, Hydrolyzed Whey Protein Isolate, Whey Protein Isolate), Maltodextrin, Taurine, Glycine, Natural and Artificial Flavors, Sunflower Based Creamer (Sunflower Oil, Corn Syrup Solids, Sodium Caseinate, Mono and Diglycerides, Dipotassium Phosphate, Tri-Calcium Phosphate, Tocopherols [Emulsifier]), Cookie Crumble Pieces (Enriched Flour [Wheat Flour, Niacin, Iron, Thiamin Mononitrate, Riboflavin, Folic Acid], Sugar, Vegetable Oil [Soybean, Palm, Palm Kernel Oil, TBHQ (Preservative)], Alkalized Cocoa, Fructose Corn Syrup, Degerminated Yellow Corn Flour, Chocolate, Salt, Dextrose, Baking Soda, Whey, Soy Lecithin), Salt, Soy Lecithin, Guar Gum, Silicon Dioxide, Sucralose, Acesulfame Potassium. Protein Blend (Milk Protein Concentrate [Supplying Calcium Caseinate and Whey], Whey Protein Concentrate, Micellar Casein, Calcium Caseinate, Hydrolyzed Whey Protein Isolate, Whey Protein Isolate), Sunflower Based Creamer (Sunflower Oil, Corn Syrup Solids, Sodium Caseinate, Mono and Diglycerides, Dipotassium Phosphate, Tricalcium Phosphate, Tocopherols [as Preservative]), Taurine, Maltodextrin, Glycine, Natural and Artificial Flavors, Salt, Soy Lecithin, Guar Gum, Red Beet Powder (Color), Acesulfame-Potassium, Sucralose. Protein Blend (Milk Protein Concentrate [Supplying Calcium Caseinate and Whey], Whey Protein Concentrate, Micellar Casein, Calcium Caseinate, Hydrolyzed Whey Protein Isolate, Whey Protein Isolate), Maltodextrin, Taurine, Glycine, Natural and Artificial Flavors, Sunflower Based Creamer (Sunflower Oil, Corn Syrup Solids, Sodium Caseinate, Mono and Diglycerides, Dipotassium Phosphate, Tri-Calcium Phosphate, Tocopherols [Emulsifier]), Salt, Soy Lecithin, Guar Gum, Sucralose, Acesulfame Potassium. Overall, PHASE8 contains only high-quality milk-derived protein sources designed to digest at different rates, putting your body in the perfect state for repair and recovery. 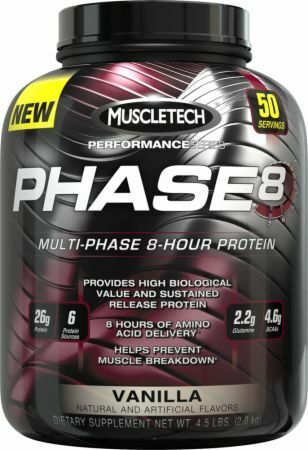 * Unlike other protein blends, you won’t find any low quality proteins like rice protein in PHASE8.